The Club is based at “The Elph”, which is centrally located on the High Street close to the top pedestrian crossing and opposite the Corn Exchange. We either use the upstairs bar (up to 30 people) or the upstairs lounge (up to 70 people). Drinks are usually available downstairs and if you plan your evening properly then “The Elph” serve really good meals. Car parking available at the front of the building. The Corn Exchange is opposite the Elphinstone Hotel. It is a very prominent building with a clock tower centrally located on the High Street close to the top pedestrian crossing. It has theatre seating (up to 114 people) and a lobby bar. There has been some recent renovation and redecoration. 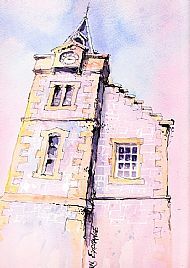 The Gillespie Centre was created from the building that was the former Gillespie Church, who’s congregation merged with Biggar Kirk. The centre has grown and changed over the last 2 decades and now provides for a wealth of activities, clubs, classes, exhibitions, as well as its busy Coffee Shop. Volunteering plays a pivotal role in the centre and new members are always welcome. The Management Committee, have secured funds from primarily the Lottery and others grant schemes to refurbish and update the centre. The centre reopened for business after major refurbishment in August 2007. There is disabled access to all parts of the centre and High Street car parking available at the front of the building. For events with larger audiences, we use the Municipal Hall at Kirkstyle. It is set back from the High Street at the junction with the road to Carnwath in the narrower southern part of the High Street, beyond the bottom pedestrian crossing. The hall can be set up a in cabaret style (up to 150 people) or a concert style (up to 250 people) and we always ensure that there is a fully licensed bar available. Limited Car Parking is at the front of the Hall (tarmac). Access is by the side entrance. Some assistance may be required for disabled persons using this facility.